Winning Question: Name 4 characters whose nicknames are the _____-talker. Answer: Low-talker, high-talker, close-talker, and long-talker. Winning Question: Name 3 of Elaine's bosses. Answer: Littman, Pederman, and Pitt. Winning Question: From whom did Jerry get fleas and what was the evidence? Answer: Newman and Chunky candy-bar wrappers. SEE WHITEBOARD IN STORE FOR CONTEST DETAILS!!! 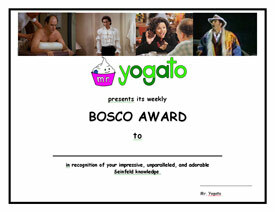 What do you get when you cross Mr. Yogato's obsessions with both Seinfeld AND trivia?? Yup, Seinfeld Trivia!!! Every other Tuesday, 7:30 pm. Winner gets a free yogurt, the highly coveted Bosco award, and a high five from Mr. Yogato himself. Come play! !